In the game of volleyball, there are six main areas of the court occupied by players that have specific roles. There are three players in the front row of the court, and three players in the back row. These players rotate in a clockwise manner each time they win the serve. Below are explanations of the different player positions and roles on the court. Setter: The setter is the person that distributes the ball to the team’s attackers. This person is a leader on the team, much like a quarterback on a football team, or a point guard on a basketball team. The setter has to think quickly and run plays for the offense. 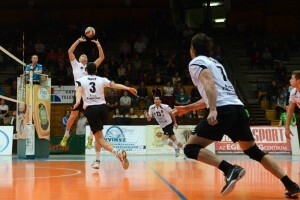 The setter ideally contacts every second ball when their team is receiving the serve. Outside Hitters: There are two outside hitters on a team. Their main responsibility is to attack the ball and put it down inside the boundaries on the opponent’s side of the court. These hitters attack the ball from the left of the court. They receive the majority of the sets during the game. The outside hitters usually have solid back row skills which allow them to stay in the game for all rotations. Middle Hitter: This player has excellent blocking skills. The middle hitter moves along the net and blocks the attacks from the opponent. The middle hitter attacks balls that are set quickly because of the close position to the setter in the front row. The middle hitter communicates blocking strategies to the team. Opposite Hitter: This person hits from the right side of the court, and they are also called right side hitters. Since they are positioned in front of the opposing team’s left side attackers, they must have strong blocking skills. The opposite hitter also helps the setter run the offense when the setter digs the first ball and someone else is needed to set the attackers. The opposite hitter is often one of the more versatile players on the team. Libero: This player is a defensive specialist. The libero has strong passing and digging skills. This person plays in the back row, and they receive most of the serves from the opponent. The libero must have good ball control and communication because they start the offense for the setter and the hitters. The libero has quick reactions and they are ready to sprint, dive, and keep the ball in play for the team. 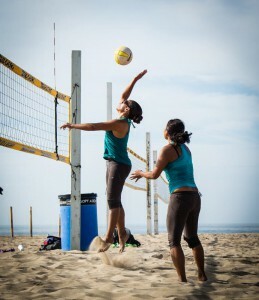 Volleyball players train hard to develop the skills needed to succeed in their designated positions. Sometimes players are capable of fulfilling multiple roles on a volleyball team. No matter how strong a player is at their certain position, the only way to win is if all players work well together. The goal of every volleyball team is to have players understand their roles on the court, and cooperate with each other to effectively execute their game plan against opponents.